Did Google really design a Chromebook with a Retina touchscreen? Check out our Google Chromebook Pixel review. Could a super high-definition Google-designed Chromebook be coming soon to a table near you? 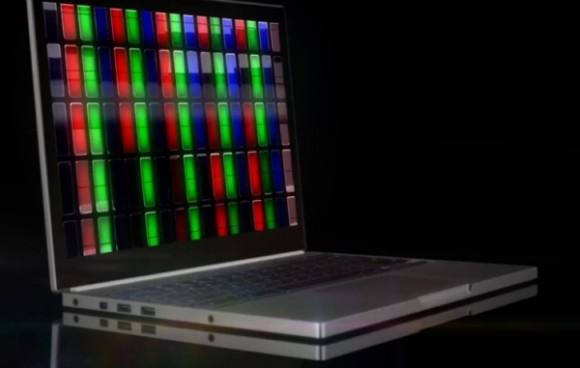 According to Geek.com, a video that appeared almost as quickly as it disappeared shows what purports to be the Chromebook Pixel, a laptop running Chrome OS. The exciting kicker? It features a Retina-like, ultra high-definition touchscreen display that may have a resolution as high as 2560 x 1700 pixels. This is just a rumor right now, though it could be a special edition Chromebook that will only be released to developers and tech press members, much like the original Chromebook made by Google, the CR-48, was a few years ago. In the video below, it looks a whole lot like a MacBook Pro with its aluminum casing and black, chicklet-style keyboard, which seems a little off. The video was produced by a company called SlinkyMe that blames hackers for the video escaping the company’s servers and making its way to YouTube. For all we know, this could just be a mock-up commercial that isn’t finished and doesn’t have the final product in it. Or it could be a hoax by Anonymous to mess with the Chrome OS faithful. Whatever it is, the display looks like it has the potential to be amazing. Android Authority managed to save the video before it was taken down. Check it out for yourself and let us know what you think. Is it real? Or is it the product of a Chromebook fan’s overactive imagination? Again, these are rumors, but they’re still fun to think about.